Using foil makes grilling simple-and a snap to clean up! Kicked up with spicy seasoning, these shrimp packets will be a hit at your next barbeque. Preheat outdoor grill or oven to 425° F. On a work surface place 4 sheets (each about 20 inches long) of heavy duty or doubled aluminum foil. In the center of each piece of foil arrange a generous 1/2 cup mushrooms, overlapping slightly; sprinkle with 2 tablespoons couscous. Top each with onion, red bell pepper, shrimp and wine, dividing evenly. Dot each with 1 tablespoon butter; sprinkle with 1/2 teaspoon jerk seasoning blend and 1/4 teaspoon garlic. Sprinkle an equal amount of salt over each portion. 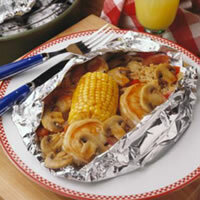 Arrange remaining mushrooms over shrimp, overlapping slightly; place 1/2 an ear of corn on the side. Bring long sides of foil together over mixture, allowing space for heat circulation and expansion; fold to seal. Fold up short ends; crimp to seal. Place on outdoor grill or in oven, about 5 inches from heat. Cook until shrimp are done (on the grill for about 15 minutes, turning once, or in the oven for about 20 minutes). Place in individual shallow serving bowls; carefully unfold foil; serve. Ingredient Note: Jerk seasoning is available in most supermarket spice sections. If unavailable, substitute 1 teaspoon sugar and 1/4 teaspoon each time, allspice and ground red pepper.